Have you ever noticed that loop packs featuring brushes are hard to find? Even more challenging is to find packs are 100% live and musical. Well, you’re search is over. We’ve heard your requests loud and clear; you want drum loops that capture beautiful warmth and natural ambiance of brushes performed with masterful musicality and artistry. Picking up where Pure Country III left off, Pure Country IV is a focused collection of entirely 3/4 and 6/8 drum loops performed with brushes. These brush loops are perfect or multiple styles of country music, folk, acoustic Americana and more. We captured the subtle nuances of live brushes in the 3/4 and 6/8 time signature, giving users a powerful and versatile package of groove loops, fills, one shots and single hit samples. 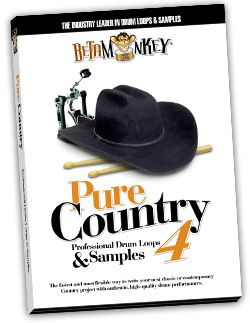 Beta Monkey Music’s Pure Country IV: Nashville Brushes™ in 3/4 and 6/8 captures the authentic sounds of Nashville with impeccable drumming and a pure acoustic mix. If you need the real thing, these brushed 3/4 and 6/8 brush beats are ready for your next track. Our fourth installment in the Pure Country Series is a complete songwriting package, featuring over 340 acoustic brush and brush/stick combo drum loops and a complete multi-velocity sample set taken from the drums used to record the drum tracks. If you need the real thing, all the nuances and textures of brushed drum parts, laid down with impeccable taste and time, then Pure Country IV: Nashville Brushes™ in 3/4 and 6/8 will deliver. There’s no substitute for the pure beauty of tasteful brush work and, if there is, we have yet to find it. Authentic Grooves: We went straight to the heart of Country music in one of Nashville’s premier drum rooms. 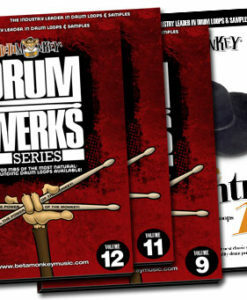 Add a seasoned pro behind the kit, with both the playing skills and knowledge of the genre and you have the absolute authority on brushed country drum loops. Versatile Grooves: Over 340 brush drum loops, covering 3/4 ballads,3/4 country waltzes, mid-tempo 6/8 feels and and more. 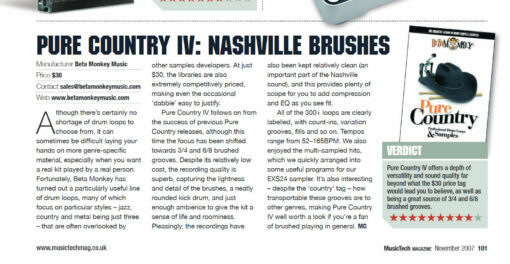 If your music needs brushes or brush/cross-sticking in 3/4 and 6/8 time, Pure Country IV delivers the brushes. Complete Song Elements: Count-ins, main grooves, groove variations, fills, intros and endings – all the parts you need for songwriting are included. A complete songwriter package. You all the pieces you need to write your next hit. without anyone knowing you didn’t have to hire a drummer! Cohesive Drum Sounds: All drum loops and samples are our Nashville Sessions, a single recording session. Mix and match any of the grooves, fills, one shots, and samples. 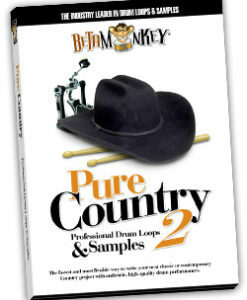 Fully-Sampled Country Drum and Cymbal Samples: A complete matching drum and cymbal samples set featuring a fully-sampled Yamaha Recording drumkit, several snares (Ludwig and Ayotte), and a number of Zildjian cymbals give you further control over your drum tracks. Extended Compatibility: Pure Country IV is compatible with the loops and samples on Pure Country I, Pure Country III and Pure Country V. Each collection was recorded at the same tracking sessions in Nashville. 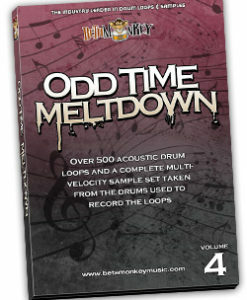 343 (695 MB for 24 bit; 450 MB for 16 bit) original, license-free 3/4 and 6/8 brush drum loops. 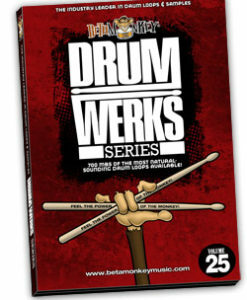 96 (52 MB for 24 bit; 35.1 MB for 16 Bit) multi-velocity drumkit, snare, and cymbal samples. ALL ACIDized WAV, APPLE, and REX2 formats included in digital download and for hard copy DVD purchases. Pure Country IV Brush Drum Loops Review: Read what MusicTech Magazine had to say about these loops. This pack of drums is actually helping me become a better guitarist. This is the first time I’ve had a chance to lay down some riffs to beats in 3/4 and 6/8 timing. I’m noticing just how many ways there are to strum some chords in these timings by playing along with the different beats. I’d definitely recommend these loops for those that want some chill 3/4 and 6/8 beats. I was working on a song in 3/4 and could not get the right feel. Found Pure Country 4 and it had exactly what I was looking for. Beautiful drum sounds, especially the brushes. Toms and bass drum deep and full. And of course perfect timing. Good stuff!! At last some beats in 3/4 and 6/8! I thought that the world was stuck in 4/4 time 🙂 . Very useful collection.